What makes this app different from others I’ve seen in this genre is its user-friendly layout. Moreover, I had yet to see a fully-featured PDF editor for the RT platform, so this made it even more interesting. 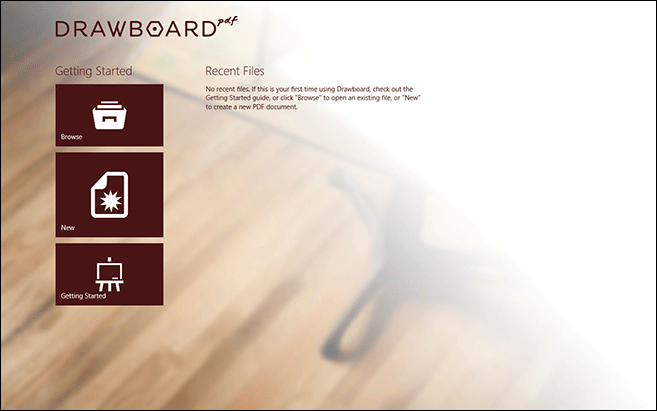 Drawboard’s purpose is to allow you edit all your PDF documents using Windows 8’s touch-enabled UI. It supports a radial menu that contains an extensive array of tools designed to let you add custom shapes, text and other tidbits to your PDF document and save it as a new file. The app supports both stylus and finger touch gestures. Upon launch, you’re introduced to a really nice looking landing screen that carries navigation buttons labeled Browse, New and Getting Started. This main screen also lets you view your recently opened PDF files, though that section is empty on first launch, of course. Getting started with Drawboard PDF is easier than you think. You can either start with a new blank document from scratch, or continue working with one of your existing PDF. The app also allows you to snap a new photo and make a PDF out of it custom annotation. Assuming you choose a new blank document, Drawboard will let you choose its page size, orientation and total page count before you begin. Besides being a useful PDF annotator, Drawboard is a nifty PDF viewer as well, meaning you can use it as a regular Modern UI PDF reader if that’s what you need. It displays current and total page count to the left. You can also zoom in and out of the document using the pertaining + and – buttons snapped to the left. The Radial menu I mentioned earlier can be activated via tapping or clicking a small hexagonal button at the top right.